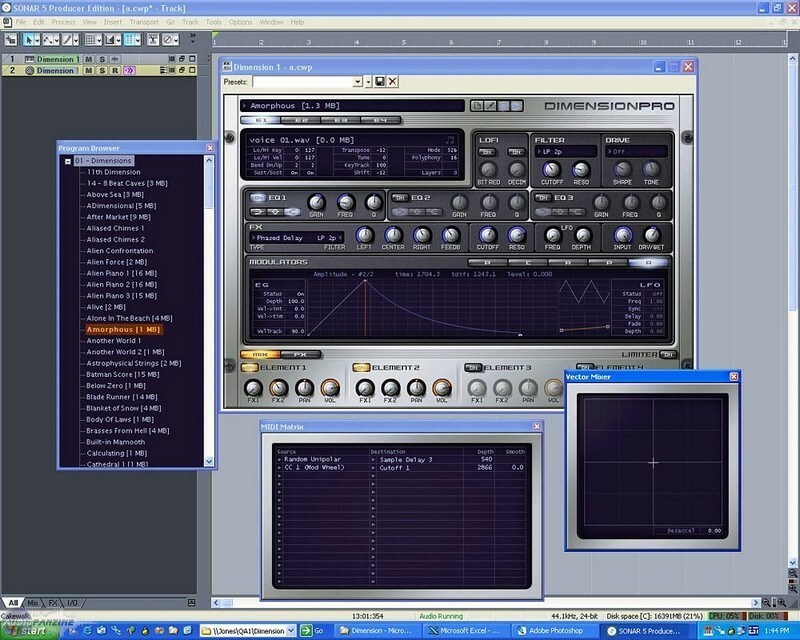 Dimension Pro, Virtual hybrid synth from Cakewalk. stamkorg's review"All right for the price"
Others aren't very good: guitars. I don't understand lucienz' review, the Dimension Pro can manage up to 4 elements per patch (E1 to E4). that is up to 4 "layers" per sound, each with filters, effects... it's excellent. But it may be that we aren't talking about the same thing. When it comes to sounds, I'd say they start to be outdated, even though they are very usable, including the pianos. It's not as good as a dedicated software, but it's nevertheless pretty decent. The control matrix is very powerful. An update of the software, a version 2 with a better library, would be nice. But to say that it's not usable it a bit far-fetched. It's a bit outdated, a version 2 would be nice. I regret that it isn't 16-part multitimbral. But then again, to use it as an instrument, 4-part multitimbral is OK.
Did you have any problems during the installation? - No issues whatsoever, the 'installation is pretty smooth. How complicated is the overall configuration? - Very easy, it's its main strength. Did you have any incompatibility problems? It works only with Cakewalk because it's a standard Vsti. Is the user's manual clear and comprehensive? - I7 8 cores, 4 Gb ram, Echo Mona soundcard. Does the software work correctly with your setup? What about the hardware+software configuration stability? It's very easy to use, its main problem are the layers, which are limited to 2! On their website they state: Mix and layer up to 4 stereo parts per program. When in truth it means 2 layers for the left channel and two for the right channel. @Stamkorg: I'm not talking about timbre layers to play several instruments, but velocity layers. The piano sound might be acceptable, but in order for the playing to be realistic, the sound must follow the force of the attack. When you play piano the sound is lowered-pitched, while forte is higher-pitched., and it must be progressive. A good virtual piano with 8 velocity layers and even more. - The free SFZ, which managed soundfonts in SFZ and SF2 format. This sampler was free but limited to two layers. The advantage of SFZ is that it uses the Ogg-vorbis format with adjustable rate --> That allows you to reduce tenfold the disk space needed without any noticeable difference to the ear => Files are decompressed in the Ram when you use them. It's a pity that SFZ+ only uses SFZ files (they probably didn't have enough time to develop it). But let's go back to Dimension Pro, which is what interests us here. Cakewalk bought these samplers (or RGC:audio?). In theory, Dimension Pro is nothing other than SFZ free, revamped with a new interface, additional controls and excellent file management. And that's where I don't get Cakewalk, why didn't take the SFZ+ engine but rather the free version for a paid software? As a consequence, it is limited to 2 layers...So, be warned: the acoustic and electric pianos, and every other sample whose sound is modified by velocity, are simply useless! ...or awful. And you still have the management of .SFZ files and the disk space saving it represents, which allows you to have a library with an impressing number of instruments. For those interested, you can get SFZ+ free... from Cakewalk. 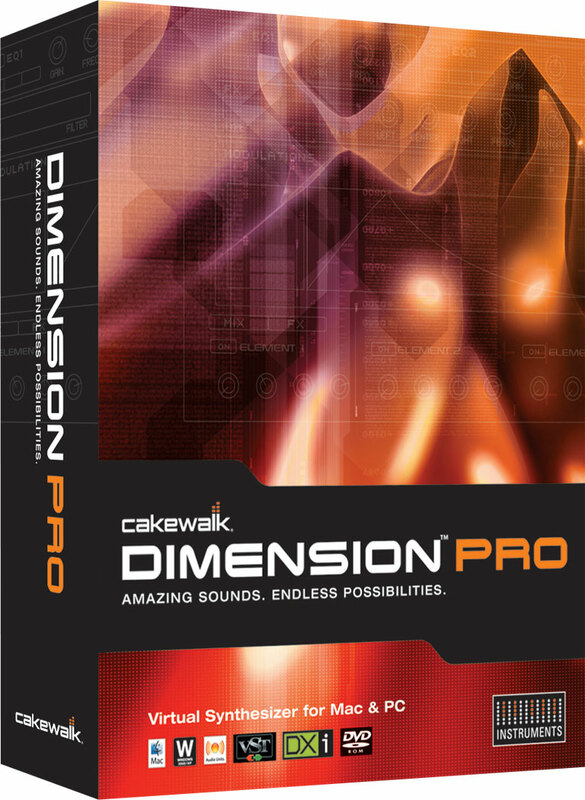 JeffTadashi's review"My standard synth for many years"
Cakewalk's Dimension Pro has been one of my standard go-to synthesizers and samplers for many years, back when I was using Cakewalk's Project5 software (my first DAW). 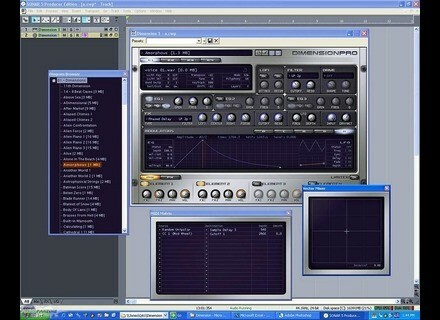 I still use Dimension Pro quite a bit with my new setup in SONAR, although I wish it was also compatible with my new Mac OS Lion system. If you are just starting in the world of synthesizers and samplers, Dimension Pro has a little bit of everything, and the sounds are great! Real pianos, electric pianos, techno synthesizers, orchestras and strings, ethic instruments, drums, and much more are included in the immense sound library. It functions both as a synthesizer interface and a sampler interface, with complete control over envelopes, LFO, polyphony, multi samples, built in effects, and routing. Dimension Pro has four separate instrument channels, which can help create deep, complex sounds. You can also chain the instruments together if you want to apply multiple effects, filters, or envelopes. Although it is easy to create your own sounds from Dimension Pro's library, it is best to work off of the sounds from the diverse sound library. The pads and leads are very easily customizable, and it's easy to see and modify the parameters. The envelope section is especially simple to work with, since it actually draws out the envelopes; no need for ADSR knobs! The sampled instruments are very good; the piano samples include advanced sound modeling of the sustain pedal. The main strings are realistic and full, and there are extra string samples from the Pocket Orchestra section as well, which are very lightweight, and sound great as well. The Rhodes have been my standard electrical piano sound for years. Overall, Cakewalk's Dimension Pro is a simple, affordable, versatile synthesizer that does a little bit of everything. Nowadays, I don't use it as much, since I have dedicated synths for many instruments, but when I was starting out, Dimension Pro was an invaluable tool.